...an amazing week for a Hairy horse that has never "transitioned" to stones - mwahahah. How I hate that word - proof is in the pudding - get the shoes off, and the diet and environment right and they don't NEED "transitioning" to specific surfaces as long as you listen to the horse and don't go mad. He's been out of shoes a year, after being in them for 10, he's never seen a stone track since they came off, and his owner reported that he struggled on Exmoor when she brought him down when shod. Yet this week, he never batted an eyelid over the worst stone tracks. 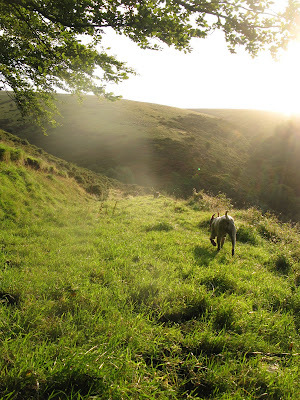 The sun is shining on Exmoor, and its been another stunning September, and I am hoping that October will be another beautiful month, as it has been the last couple of years. I almost makes up for the dire weather in July and August! ...and here ARE the labels! Someone has also listed the "explanations" given by one company as to the sugar and starch levels in its feed, and its an interesting insight into the parallel universe that some feed companies seem to inhabit. ...I've been putting it off for a couple of weeks now, but today there was no alternative...The clippers came out and Felix was the first victim! A combination of warm weather now and chilly weather a few weeks ago means that despite rugs, their winter coats are coming through quite quickly, and with Felix being part pony he is already looking woolly. In this sort of weather its all too easy for them to get very hot and dehydrated with hard work, so it had to be done. I shall hold off clipping the others as long as I can - though Jacko and Bailey will have to be done soon, Hector and Angel have no coats to speak of yet - long may that continue! It happens so often - someone is innocently feeding their horse the best possible feed, bought often at vast expense, and can't understand why the horse is footy. They've understood that they need to focus on the horse's diet, so perhaps they are already being careful with their grazing and have tried to avoid sugary feeds. They know that minerals are important so they provide a broad spectrum supplement for their horse. If they are VERY conscientious, they may even have sought advice via a feedline or on an internet forum. As a result of all this research, they formulate their horse's diet and can't understand why its still not working. There was a great example of the UKNHCP forum today, but it happens all the time when I see clients too. The feed in question was a well-known "Lo Cal Balancer" - but it could just as easily have been marketed as "Ideal for Laminitics" or "Low Sugar, High Fibre". In fact, the ingredient list included barley, wheatfeed, mollasses and soya, and only a small amount of pre-mixed inorganic minerals. The starch content was 10% and sugar 2%. Surprise, surprise, when the horse changed to a genuinely low sugar mineral supplement, which consisted mostly of bio-available plant minerals, it improved dramatically. 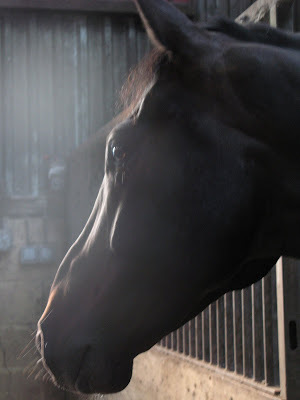 Feed companies are there to sell feed - with the best will in the world, they rarely dispense genuinely impartial advice - only independent equine nutritionists can do that. What goes onto the bag is ONLY marketing, and cannot be relied on - there are plenty of "low starch, low sugar" feeds which have given horses laminitis, and there are a number of supplements which are notorious among barefoot horse-owners as so many horses are footy when fed them. You can ONLY rely on what is on the statutory ingredients list. Most feed companies underestimate the magnesium levels necessary for horses because its a poorly researched area, and Mg deficiency is more commonly recognised in sheep and cattle than horses (probably because it tends to kill them!). If your horse is not rock-crunching and you aren't sure why, be systematic and read through what is in your feed - be ruthless - exclude anything that might be causing trouble for at least a month, supplement with bioavailable minerals and the right level of MgO, and see if the horses improves. For the uninitiated, "NOS" means national occupational standard, and a NOS is a benchmark setting a standard for training in a particular sector across the UK. So, for example, there are NOS in farriery and all farrier training within the UK, whichever college or trainer provides it, must cover the knowledge and skills set out in the NOS. The last few months have seen LANTRA working both on revising the current Farriery NOS and on setting up a new NOS to cover barefoot hoofcare. Obviously, there are key differences as well, and whereas both NOS cover trimming, the farriery NOS then branches out into making and fitting shoes and all the metal and forgework which that requires. By contrast, the barefoot NOS then has detailed elements on environment, nutrition and exercise, all of which are such essential factors for barefoot performance. The drafting of the NOS is nearly finished, and the new NOS, provisionally called "Equine Barefoot Care", to distinguish it from farriery, will be out for consultation from early October. Pathetic mileage this week, I am afraid! The horses have only done the most feeble amounts of work this week, I am afraid, and hunting has had to very much take a backseat to everything else that has been going. Farrier trim or barefoot trim? "cranky, untrained and potentially dangerous"
Here is the problem - for taking a horse out of shoes and getting its hooves to the point that it could work hard barefoot, I would view most farriers AND many trimmers in exactly the same way - farriery training does cover trimming, but certainly not barefoot performance, and trimmers can practice without any training at all. The result is that there ARE trimmers (and farriers) out there who are potentially dangerous when let loose on a barefoot horse. Equally there are farriers AND trimmers who are exceptionally competent in helping hooves achieve barefoot performance. Can her farrier trim her horse? Yup, probably, although if he is not familiar with how a hoof works barefoot, he will probably leave hoof wall too long and may worry when it starts chipping and cracking. And of course if he is one of those farriers (and they DO still exist) who routinely trims sole and frog, the horses may be sore after each trim. But lets assume that he does a safe, non-invasive trim, as all good farriers and trimmers should, which encourages the weak areas of the hoof to work without over-stressing them, and allows the horse to grow stronger hooves both internally and externally. The issue is that the trim is only a tiny, final part of helping that horse to grow the healthiest possible hooves. If her farrier can't also advise her on the correct diet and environment for the healthiest hooves, and advise her on what exercise programme she needs to develop areas of the horse's hoof that will have been weak in shoes and need to be strong to work barefoot, then the trim he performs will be largely irrelevant. The fact is that barefoot performance requires optimal hoof health. Optimal hoof health requires correct diet, environment, exercise and trimming, so whoever you choose to trim your horse had better have more in their toolkit than a rasp and a pair of nippers! I missed these links, which came out recently. Then Annabel Groom at the Western Morning News has also done a lovely follow-up, with some info on Project Dexter as well, which you can see here. At the conference, Matthew Jackson did a presentation on some research carried out by him and others in Northumberland, which reminded everyone that horses' feet face serious challenges from grass in our climate. He had been trying to find a way to make life easier for horse owners on livery yards who are unable to regulate their horse's management and are forced to turn horses out at unsuitable times (eg during the day onto Spring grass) with all the hoof problems that result from that. Its a really common complaint both from owners and on the online forums, and its one that I think we can all sympathise with. Do you stay on a yard where most aspects are great, but grass management is not? If you stay, chances are you will need to keep your horse shod or use hoof boots for part of the year - not a disaster, but frustrating if you want your horse to have the healthiest possible feet. The problem is that the magic bullet doesn't exist - one of the tough things about barefoot is that you are forced to recognise that unlimited UK grass is a huge health challenge for most horses' hooves. Rather than trying to address the symptoms - the ripples on hooves and the evidence of footy horses - shouldn't we be trying to solve the underlying cause? Of course there are many livery yards which will dig their heels in and refuse to recognise what is happening, but many yard owners simply have no idea what they are seeing in hooves and may not realise how much healthier they can be when grass is managed more effectively. From a grassland management point of view, fields are much more productive and in better heart, too, when horses are kept on tracks for at least part of the time. Who knows? in 10 years time it may be common place for the best livery yards to have track systems, but it will only happen if horse-owning customers start asking for it and explaining the benefits. While at the UKNHCP conference I saw a very gloomy headline in the Independent about the Arctic sea ice warming up and melting even faster than anyone ever predicted, and it got Mark Johnson, one of our farriers, and I thinking about the green aspects of going barefoot. I am sure there are more, but here are the obvious benefits that we came up with over a pot of tea and some toast! on a track system, fields are less poached and have better biodiversity, and allowing grasses to mature for a hay cut is better for some rare insects too. I was away over the weekend at the UKNHCP conference, where we had a very useful and interesting couple of days but it involved a heck of a lot of driving, so it will take me a few days to catch up! As the previous week was so busy, the hunting mileage was very low, so I haven't bothered to give it a separate blog, although I will update the totals. As a follow on from yesterday, here are the photos of Hector's back when he first arrived, in July 2008, in the top photo. You can see that his right hind quarter was atrophied, and that over a period of 3 months the muscle strengthened and rebuilt, as the lower photo taken in October 2008 shows. Although the muscle had not deteriorated as badly over the summer, it must have been enough to weaken it internally, even though there was no visible atrophy. 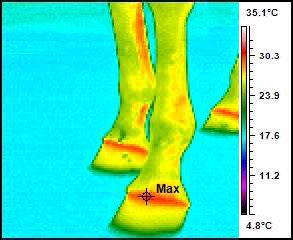 At the top are the thermography scans, and you can see that the knees and feet are in perfect shape :-) and that the real problem is the muscle tension is in his right hindquarter. I suspect that the area of heat was more severe a few weeks ago, as his soundness is so hugely improved since he came back into work. He has always had a weak semitendinous muscle there, and thats obviously the Achilles heel we need to keep an eye on in future. As some of you already know, H injured his knee at the end of last season, and although he seemed fine on it initially, once he had some time off he seemed to become less sound on it, although he was happy enough to blast round the track or field and stand on his head with the other boys. My thought at the start of the summer was that the best option would be to give him June and July off and re-assess how he was in August, when I got back from Ride Bare. Unfortunately, the rest made him no better and I started to worry about whether he had really done some damage when he fell, so asked the vet to X-ray his knee. At this point, when we trotted him up he appeared significantly short on his left front leg. Disaster scenario, thinks I.
Vet and I, if asked, would have put money on a hairline crack or chip at this point, but the X-rays came back completely clear. Good news, but we were no nearer finding out what the problem was. We talked about the fact that H had been sound even after the knee injury, and had only become lame once he had time off, but that didn't seem to shed much light on things either, though in fact it should have been a clue! Now, he came here originally with bad feet and a severe toe first landing, but he has had great hooves for a long time now, and despite being lame on his left front, he was still landing clearly heel first. His hooves were also in perfect condition, and I couldn't believe that it was his feet that were the issue. The vet, however, re-iterated the standard position that 90% of lameness is in the hoof* and said her preferred next step would be to nerve block the foot. Fortunately, as Hans was due here this week, I persuaded her that we would wait and first of all use the thermographic camera to get a clearer idea of where the problem was. In the meantime, with the vet's permission, I had brought H back into work, and sure enough, the more he did the sounder he became, to the point that he was trotting up the road prefectly by last weekend. The thermographic images showed that his knees were fine, his hooves were fine, and in fact the problem stemmed from a tear in his right hind hamstring. It looks as if the time he had off allowed it to weaken, and it was making the right hind/left front diagonal unstable. I will carrry on working to build that area back up, and hope that, provided he has no more holidays, then he will go from strength to strength. Under "normal" circumstances, though, it would have been so easy for the focus to be on the hooves. Not only would that have been the wrong conclusion, but would have led to nerve blocks, more X-rays, and we would still have had no answers, plus continued "rest" would have actually made the muscle weakness worse and worse! *Actually not a true statistic when you are talking about hard-working bare hooves, but we'll talk about that another day! ....a fascinating afternoon yesterday with Hans Arendse, one of the UKNHCP instructors from the Netherlands, who is staying here en route to our conference at the weekend. 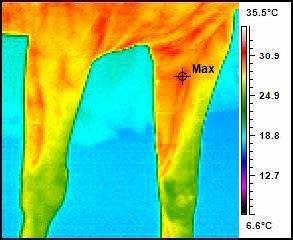 He has been working a lot with vets using a thermographic camera, and its proved to be a fantastically useful diagnostic tool. I'll post more, and some images, next week, but Hans demonstrated on a couple of the horses here yesterday, and the level of information you get is remarkable, especially when you ally it with your own background knowledge of the horse, its way of going, and any past problems - it provides a brilliantly clear way to confirm or rule out trouble-spots. From what I've seen, it beats X-rays hands down, so much quicker, and of course you can look at the whole horse within a matter of minutes, with no need for sedation and none of the massive drawbacks of expense and stress associated with MRI or scintigraphy. A real eye-opener! More on that later, and for those of you who are coming to the conference, you'll find Hans' presentation very worthwhile. Latest news from Project Dexter! Had some wonderful news from Kelly and Dexter over the weekend, plus this lovely photo of them looking the business. 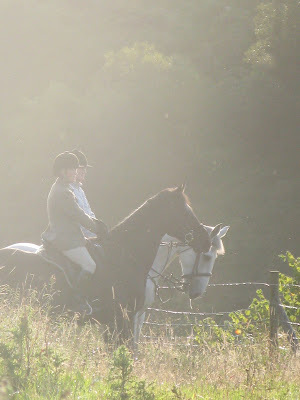 They came second in their one day event and finished on their dressage score! Angel had a new experience on Saturday. He came in, ate his breakfast and had a snooze - nothing new about that, thought Angel. Then a lorry pulled up next to his box. First some new horses came out, then masses of puppy dogs. Then more new horses came into the yard, followed by quad bikes and 4x4s. How strange. All the other Rockley horses seemed to know what was happening but Angel didn't. However, he thought it was very interesting, and watched everything intently. After a while, he went out with his girlfriend, Bailey, and they saw that all the other horses and the puppy dogs were out there in the sunshine. The puppy dogs went round and round and said "Wooooa-wooa-wooooa" a lot. There is a picture of Angel standing next to Bailey here. Angel walked round the fields with Bailey, and managed to avoid the cows, which began to gallop about. Luckily they stopped because Bailey was in the way. Bailey is brave with cows. Angel is not. After a while, Angel went home and ate haylage, and thought about what a fascinating morning it had been. Not a huge amount of mileage, but after all the rain we have had the ground is extremely hard work for the horses, with Friday in particular being like knee-deep glue. They are all fine and raring to go again, but it would be nice if it dried up a bit(!). 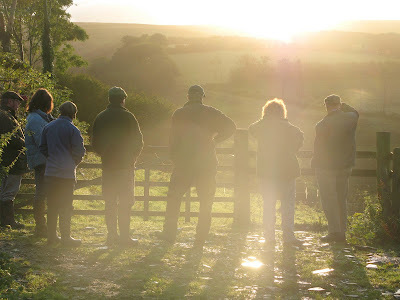 We had a meet here this morning, at very short notice but it was a nice way to start a beautiful Saturday morning, and I think the field and footies appreciated egg and bacon butties and cups of tea at 7am - it woke us all up a bit anyway. As an added bonus, 3 of the hounds out were puppies whom we'd walked last year or the previous year, and they were on terrific form and there were joyful mutual reunions all round. 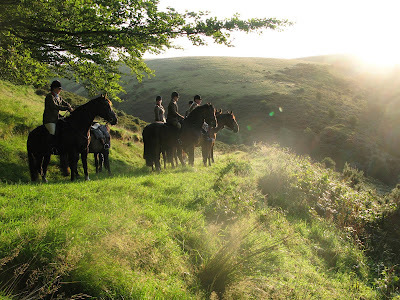 The horses who weren't hunting did the equine equivalent of watching widescreen tv, standing in the yard where they could get the best view of the Stig and the hounds, and drinking in all the action. Sam had her camera out and took these beautiful photos, so thanks to her - it was definitely a day when Rockley was looking its best! This particular pony is a companion to their riding horse, and as he can't be ridden they are finding it hard to keep weight off him. He's quite a feisty little chap, and although not malicious can be pushy at times. They described the problems they had lunging him, and that they were thinking of getting a trainer to work at improving his manners on the lunge. But what they described was more than just pony fidgets - they said when they put him on the lunge "he just leaves and we can't stop him". As it happens, the pony has very weak front limb conformation with an incredibly narrow chest, and watching him trot up after his trim it occurred to me that his shape makes it incredibly difficult for him to balance on a circle because he just doesn't have the pectoral muscle to enable him to stabilise his front limbs properly. Talking it through with his owner, we came to the conclusion that most likely its not that he won't lunge - after all he is more than happy to be led out in hand, and stands politely to be trimmed - but possibly that he can't, and his only option is to "leave". Of course, I'm not saying that ponies (or horses!) can't be monkeys sometimes, but what made it clearer in this pony's case is that he has very knowledgeable, consistent owners who have turned him into a very happy pony, so his behaviour on the lunge is uncharacteristic. It reminded me that if an otherwise genuine horse appears to say "I won't", its always worth thinking about whether "won't" might in fact mean "can't". I've been planning to put up ridden photos of Uriel (or Angel, as we call him for short) for a while, but haven't managed to take any(!). Luckily for me, on Sunday Sam brought her camera out despite the weather being utterly grim (what a surprise). 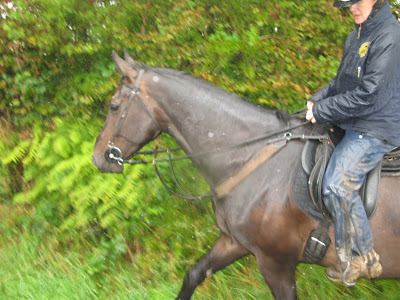 Excuse my rather skanky waterproofs, but really there was no alternative! Amazing or artificial - or both? The horses these days have more and more comic-book movement. They look so unnatural and few of them stay sound for long.... although given how they are ridden, I'd go lame pretty darn fast too. 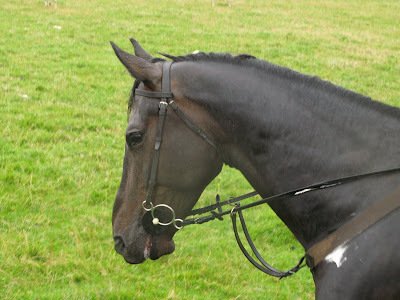 Having said that, one rider and horse did look better than the rest, the horse was calm on a long rein after the test. This horse looked like he found it pretty easy, and didn't need a continual stream of yanking and poking to get the movements. It all flowed. He was, however sweating like a demon, and I can't say he looked like he was enjoying himself, but at least wasn't actively being hoiked around. I don't like the movement, and I don't like the training methods behind it, but it did look like a less unpleasant experience for the horse and oh to be able to ride like the rider and use it for good not for medals at the expense of the horse! Not one of the others we saw were the same, they all yanked, leant back, hollowed their backs and braced against the horse to hold it in. Meanwhile, spurs a jabbing. It looked awful. Although there is a lot to admire when you see it, I have the same sense of unease. As a matter of interest, and bringing this back to hooves for a second, Caroline had a fantastic young KWPN who went abroad earlier this year. I'd seen him as a 4 year old and he had the most stunning fluid natural movement I've ever seen. In his first ever dressage test he scored 69%...but then the new owners decided they needed to shoe him to "improve" his movement. It may impress the judges to artificially change his stride, but again its a question of long-term soundness. Apparently we have only had 12 dry days here during the whole of July and August - in other words 4 days out of 5 have been wet :-( It certainly feels like it - sploshy ground, fast-growing grass and saddles that are barely drying out between soakings...Its also muggy and mild, so perfect weather for bacteria and fungus, and perfectly horrible for hooves. Both Jacko and Ghost have come down with abscesses in the last day or so, which is very unusual, and I suspect that is down to the warm, wet weather as well - despite the fact that the horses are spending their days on the track, its wet out there too and even in the barn its constantly humid.